Nick Lubovich and his son, George, at the future site of a 100-year time capsule marking the Pullman neighborhood's monumental year. PULLMAN — What started as a home improvement project — tearing out an ugly, unused staircase in a landmark mansion — morphed into a plan to capture an important moment in the neighborhood’s long, sometimes tumultuous history. Nick Lubovich, who moved into the hulking greystone mansion across 112th Street from Greenstone Church a few years back, has been fixing the place up ever since. And this year, all he wanted to do was tear out the strange “second front porch” and create a place to put his lawn and garden tools. But, like most construction projects in houses more than a century old, demolition exposed secrets about the place. After all, this year literally has been a monumental one for Pullman after President Barack Obama came to town to declare the historic neighborhood a national monument. But that’s not all. Method Soap opened the South Side’s first new factory in 30 years in Pullman. And a few weeks back, the Dutch royals came to visit the neighborhood, which was first settled by Dutch farmers in the 1860s. “This being the year that Pullman became a national monument is something that people will be talking about for the next 100 years, so I think it makes sense to pack up all the writings, pictures and anything and everything people want to bring. We’ll put a bronze plaque there that says, ‘Do not open for 100 years,’” Lubovich said. Lubovich said he plans to fill a 55-gallon drum with artifacts — paintings by local artist Ian Lantz; bottles of Argus’ Pullman Monumental Ale and Method Soap; campaign signs for 9th Ward Ald. Anthony Beale; banners from Obama’s visit; and loads of pictures, among other things — and seal it up under the porch for a new generation of Pullmanites to discover in 2115. 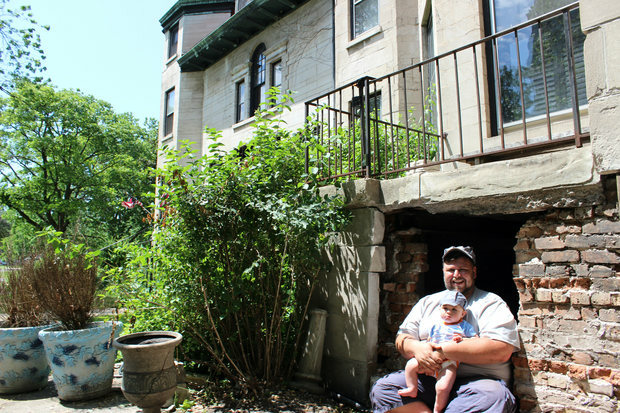 The Argus Brewery historian, who lives in the greystone with his wife, Barb, and their son, George, (who is not named after the railroad mogul), says he’s not worried that whoever owns the place then won’t be interested in opening the makeshift vault under the stairs. “Someone who owned this house in the ’60s told me that it has always been a special place that people would go in Pullman, no matter whoever lived in it,” he said. The corner mansion was built as part of George Pullman’s effort to spruce up his factory town for the 1893 World’s Fair. Around the same time, Market Hall was rebuilt after being gutted by fire, and the circle of Italian-style colonnade buildings around it were added. Dr. Lyman Ellis, the Sherwin-Williams company physician, lived in the house around 1920, according to the U.S. Census. During that time, he saw patients in what’s now the Lubovich’s parlor, sometimes late at night, the homeowner said. “A woman who lived in Pullman told me that she remembered taking her sick kids over there in the middle of the night … knocking on the door to see the doctor,” Lubovich said. Lubovich said he may write a letter to the neighborhood's future residents expressing his hope that all the positive things that sparked a community revival in 2015 continue well into the future. Lubovich says neighbors are invited to donate their own artifacts to the time capsule, which he hopes to seal up in the next few weeks.